Tata Motors has two big launches planned for next year. One is the Harrier and the other catering a much larger volume segment is the premium hatchback. Rivalling against the likes of Maruti Suzuki Baleno, Hyundai Elite i20, Honda Jazz and Volkswagen Polo, the 45X (X451 codename) hatchback will debut during the course of 2019. Ahead of which we can expect Tata to run a lengthy teaser campaign just as for Harrier and the 45X’s development appears to have evolved consistently over the last few months. Compared to the previous months, the test prototypes spotted lately are likely wearing production-ready parts. 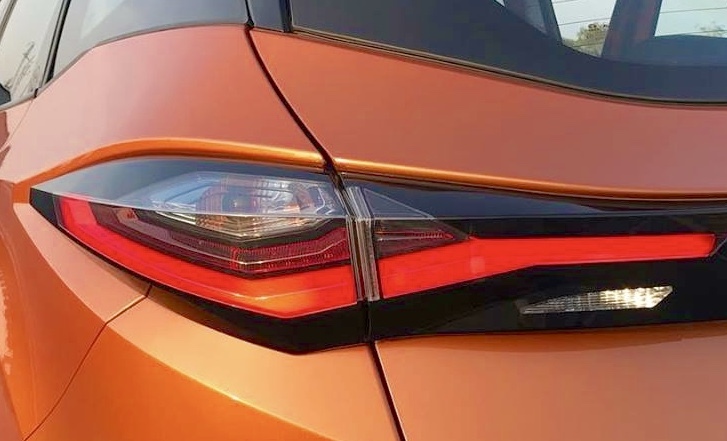 The spy picture posted here indicates the production–spec taillights of the upcoming 45X. The horizontally positioned LED cluster is a wraparound unit and since the 45X is based on the same Impact Design 2.0 philosophy, it has plenty of resemble with that of Harrier’s taillights. It also comes equipped with a roof-mounted spoiler and high mounted stop lamp. The registration plate is present on the rear bumper and the rear glass area should offer better view compared to the Nexon. Just as the Harrier, the 45X has sweeping front fascia but the headlamps are more pronounced and the grille slightly angled towards the bumper section. The signature feature of the side profile is the door handles mounted on the C-pillar. Tata is expected to use more powerful versions of the 1.2-litre Revotron petrol and 1.05-litre Revotorq diesel engines in the 45X. However, several reports suggested that the brand could opt for a mild hybrid system with the petrol powertrain. The engines are more likely to be offered with both manual and transmission choices with multi driving modes. The interior will boast a large touchscreen and the dashboard and centre console should share plenty of bits with the Nexon. We can expect quite a few segment first features on the 45X premium hatchback.